.. many school districts are adopting 4-day school weeks. Part of the reason is shortage of funds. The amount spent per student for public elementary-secondary education for all 50 states and D.C. increased by 3.2 percent to $11,762 during the 2016 fiscal year, based on new data from the Census Bureau released May 21, 2018. The increase in spending in 2016 was due in part to the increase in revenue across all 50 states and D.C. In 2016, public elementary-secondary education revenue, from all sources, amounted to $670.9 billion, up 4.6 percent from the prior year. This is the largest increase since 2007. Yet for many districts this is not enough. This section provides access to tools and data to to examine K-12 school district finances — sources and uses of funds for FY 2016. The Census Bureau collects these data annually to meet to needs of the National Center for Education Statistics. ProximityOne restructures and integrates these data with other data for GIS/geospatial analysis using the CV XE GIS tools and School District GeoDemographic Information System (SDGIS). • Create/view profile for a district(s) of interest. 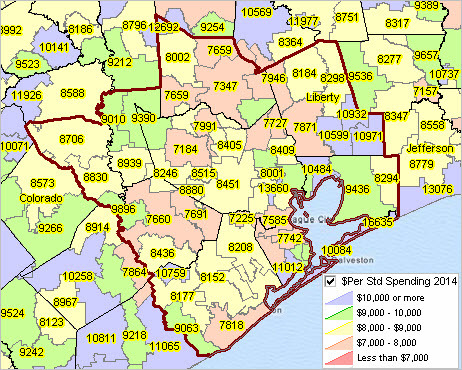 The following graphic shows patterns of current spending per student by school district, FY 2016, for Texas and adjacent areas. The four largest Texas metros are shown with the bold brown boundary; counties with gray boundaries. Color/fill patterns and corresponding values are shown in the inset legend. Click graphic for larger view showing a partial mini-profile for Houston ISD (at pointer in map). – view developed using the CV XE GIS analytical tools. – use these tools on your computer to examine these data & related geography/subject matter. .. while enrollment in many school districts is growing, for many it is declining — these include some of the largest districts. Declining enrollment in school districts can result in school closings that destabilize neighborhoods, cause layoffs of essential staff and concerns that the students who remain are some of the neediest and most difficult to educate. See related narrative. Based on total population, the largest 10 school districts in 2016 (see table below), all experienced an increase in population over the period 2010-2016. Five of these districts had a decrease in school age population (ages 5-17 years). Five of these districts had a decrease in the number of related children in poverty in families ages 5-17 years. See the related Web section that provides tools to analyze annual demographic data for each U.S. school district for the period 2010 through 2016. This post summarizes selected details. These data include Census Bureau official 2016 estimates available for all districts. Developed for use as inputs for the ESEA Title I allocation formula, the data have broader uses of interest to school district demographics stakeholders. The 2016 estimates were released in November 2016; 2017 estimates become available in late 2018. ProximityOne uses these data in combination with other data to develop school district current estimates and annual projections through 2022 with related drill-down demographic-economic subject matter. Use the interactive table in the Web section to view, rank, compare demographic characteristics of districts of interest. The graphic below shows school districts with total 2016 population of 1,000 or more by poverty incidence. Markers show the population ages 5-17 in families in poverty as a percent of population ages 5-17. Salmon markers: 40-50%. Red markers: 50% or more. – view developed with CVGIS software and related GIS project. Use the interactive table to view, rank, compare demographic characteristics of districts of interest. …tools & data to map & geospatially analyze school districts. Ready-to-use state-by-state GIS projects may be downloaded enabling you to view and create custom maps almost instantly. Benefit from the power of using GIS software to perform tasks not available on Web-based mapping options. Use the latest school district and related shapefiles. See more information about using these resources in this related Web section. Create views similar to the one shown below. Optionally combine layers as illstrated here by showing four Texas metros. .. view developed with CV XE GIS and related GIS project. Examine reference maps at the state, regional or local level. Optionally combine with roads/streets and other layers. Select from many ready-to-use demographic-economic subject matter items to create custom pattern views. Zoom-in to a school district of interest. Set attributes of district as shown here. Visually examine the boundaries or school districts and counties. 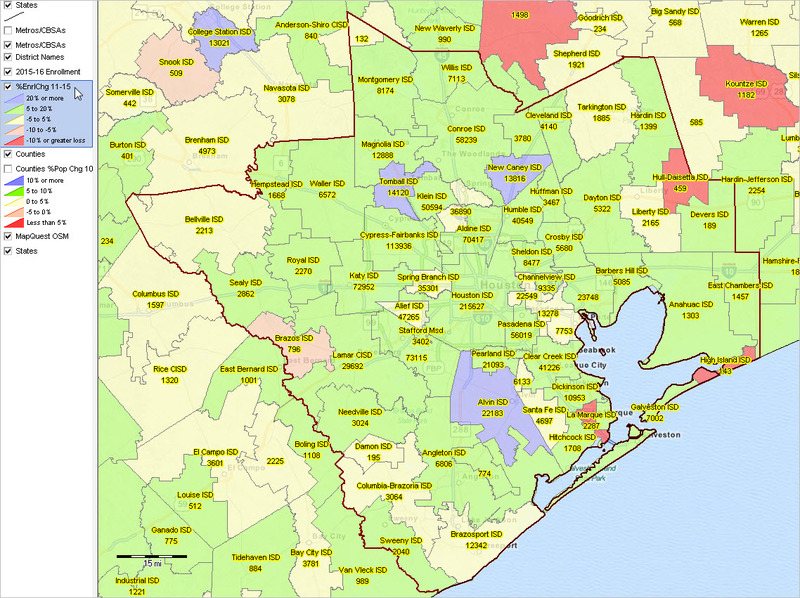 This view shows Harris County, TX area; select a county of interest. Add road/street and other layers. Drill-down within Fort Bend ISD, Houston metro, showing general earth surface features with streets layers. Mouse used to click on street (see pointer) and display mini-profile of street segment attributes. Schools and teachers: consider using these resources for classroom use. Familiarize students about how GIS resources can be used with a minimum of learning time and no cost. Enable students to use their own geography and adapt that learning to more general geography. See related Mapping Statistical Data ready-to-use GIS projects. .. NCES Program updates .. tools, data & methodology to examine national scope children & education .. school, school district & extended geographic-statistical data with drill-down to school and intersection level. See more about the NCES Program below. – more focused blog updates coming soon. 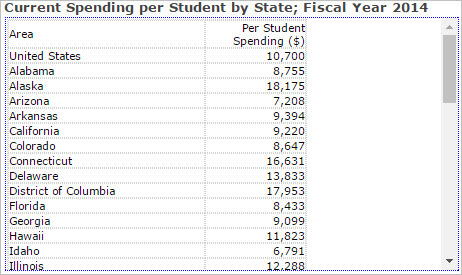 Use the interactive table to examine economic characteristics of school districts. Below is a list of the 10 school districts having the highest median household income developed using the Economic Characteristics interactive table. Develop similar views for metros and states of interest. – ranked on item E062 — median household income. Use GIS tools to develop thematic pattern maps such as the one shown below with NCES GIS projects. Select from hundreds of statistical measures. Create your own regional;/district views. Integrate other data. – view developed with CVGIS software & related GIS project and data. See the School Districts Economic Characteristics Interactive Table. The National Children & Education Statistics (NCES) Program provides access to tools, data & methodology to examine national scope children’s demographics & education-related characteristics. These resources enable stakeholders to view and analyze detailed geographic and statistical data at the school, neighborhood, community, attendance zone, school district and higher level geography. Integrate these data with drill-down demographic-economic data to the census block and intersection levels. Examine characteristics of schools, school districts and education data with related and higher level geography including urban/rural, cities, counties, metros, state and the U.S.
Click a link to view more detail on a selected topic. .. data and tools to examine how school districts of interest are changing … based on total population, the largest 10 school districts in 2015, all experienced an increase in total population over the period 2010-2015. Five of these districts had a decrease in school age population (ages 5-17 years). Four of these districts had a decrease in the number of related children in families ages 5-17 years. See characteristics of districts in this interactive table. See the related Web section for more details. More than 600 of the total 13,245 school districts have a total 2015 population of 100,000 or more (red markers). Analyze annual demographic data for each U.S. school district for the period 2010 through 2015. 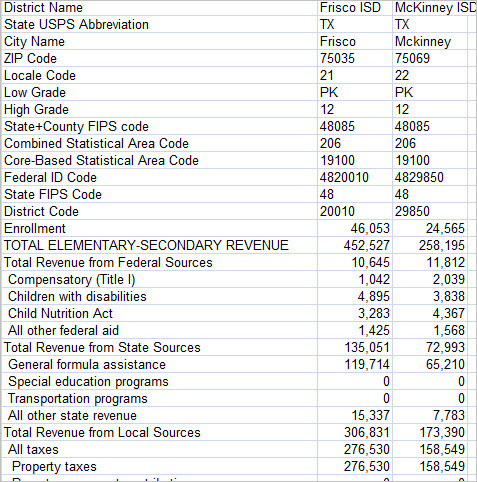 These data include the Federal official 2015 estimates available for all districts. Developed for use as inputs for the ESEA Title I allocation formula, the data have broader uses of interest to school district demographics stakeholders. Use the interactive table in this section to view, rank, compare, query demographic characteristics of districts of interest. Use the interactive table to view, rank, compare, query ZIP codes based on a selection of demographic measures. The following graphics illustrate how the table can be used. Click graphic for larger view. Try it yourself. Use the table to examine a set of districts on your selected criteria in for a state/area of interest. .. while we might first associate K-12 school systems with children and education, they are also an important part of the economy .. jobs, businesses and more. Total expenditure by public school systems, mostly school districts, was $613.6 billion in fiscal year 2014, up 2.6 percent from 2013. These data are based on the latest survey of public school systems conducted by the Census Bureau and sponsored by the U.S. Department of Education. This section provides an overview of these data and tools to access and view/analyze the data. See related full Web section for data access and more details. … Houston metro area .. click graphic for larger view. Use the interactive table in the related Web section to examine sources and uses of funds in school districts of interest. The following graphic illustrates use of the table to view selected characteristics (select from many other items) of districts in the Houston metro. Districts are ranked on percent total revenue received from Federal sources. Click graphics for larger view. Follow steps in this related section to create analytical profiles for selected districts. Join me in a Data Analytics Lab session to discuss more details about accessing these data and using wide-ranging demographic-economic data and data analytics. Learn more about using these data for areas and applications of interest. .. new data, new insights .. in the 2015-16 school year, there were 21 school districts in Texas (of a total 1,025) with enrollment of 50,000 or more students. Among these districts, six districts experienced an enrollment decline between the 2011-12 and 2015-16 school years. Four districts experienced more than 10-percent increase in enrollment (Frisco, Katy, Conroe and Klein). Use the interactive table to view, rank, query and compare Texas school districts by annual enrollment, 2011-12 to 2015-16 , and change over the period. 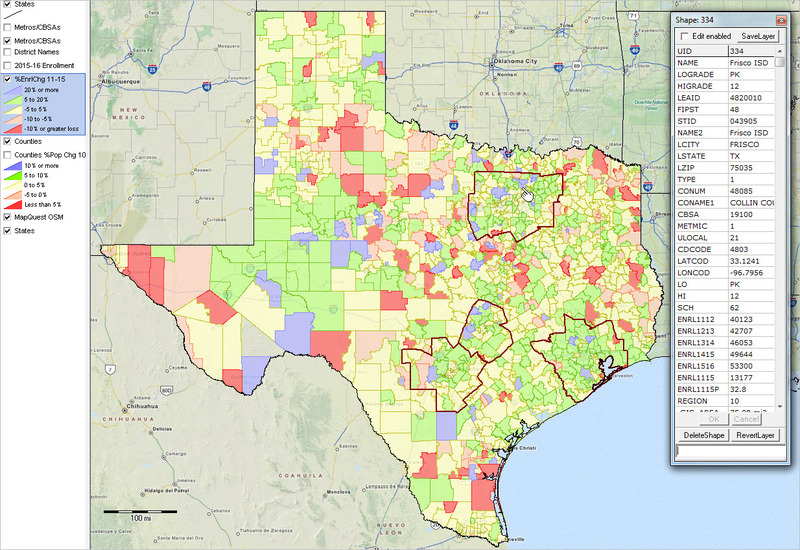 This section provides access to data analytics tools to examine patterns and characteristics of enrollment for Texas local education agencies. Use the GIS project and datasets described here to examine districts and regions of interest. See the full Web page for more comprehensive version of topics reviewed here. The following graphic shows patterns of the percent enrollment change by Texas school district during the period 2011-12 to 2015-16 school year. The percent change intervals/colors as depicted in legend panel at left of map window. Create custom maps similar to this view for your regions of interest. Examine alternative patterns such as percent change for different time periods, enrollment change or enrollment level. Set queries to include school district by peer group. Click graphic for larger view with more detail; expand browser window for best quality view. View developed with CV XE GIS software using the Texas school districts GIS project. The following views (click link) show a zoom-in with districts labeled with name and 2015-16 enrollment .. install the software and GIS project on your Windows computer for alternative and more detailed views. 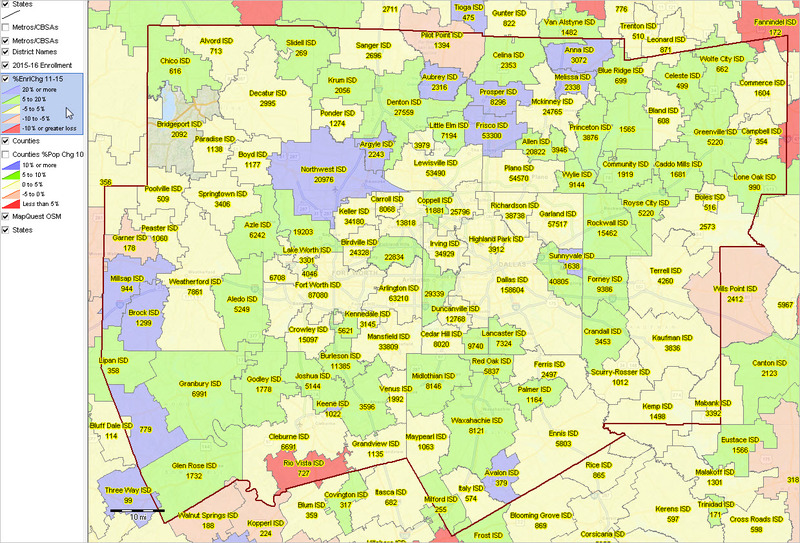 The following view shows patterns of school districts by locale code. Examine districts based locale code in the interactive table below. See more about locale code below in this section. 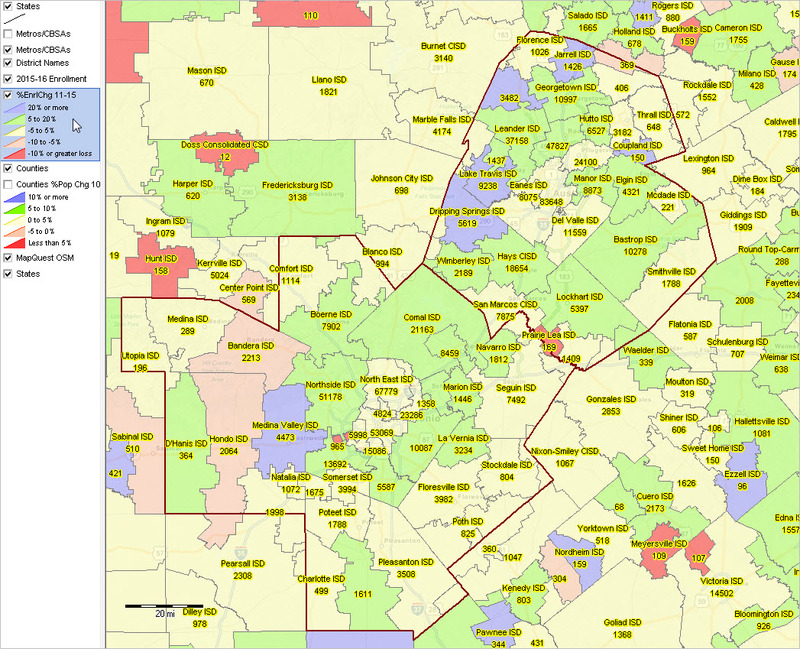 View developed with CV XE GIS software using the Texas school districts project. Use the following interactive tables to view attributes of individual school districts in context of others. These are national scope tables; select only Texas (or other state) using tools below table on respective pages. Compare Texas (or other state) school districts by national scope peer group size. More about data analytics and analyzing the school district community. The following graphic illustrates use of the interactive table. This view shows districts having 2015-16 enrollment 50,000 or more ranked in descending order on the enrollment percent change from the 2011-12 school year to the 2015-16 school year. See the full interactive table to perform similar operations. Click graphic for larger view. See about other demographic-economic interactive tables.